PATRICK BAMFORD has been here before. Four years ago, in fact, when on loan at Middlesbrough and chasing a place in the Premier League. Like this season, the run-in was a tense and fraught affair that saw all those in the hunt for automatic promotion changing places on what felt like a weekly basis. Boro, for instance, went from fourth to third to top spot and then back again to fourth during the final five instalments of a thrilling race that was eventually won by champions Bournemouth, with Watford finishing as runners-up. Bamford, fresh from scoring the two goals in midweek that took Leeds United back into the top two, is hoping for a much happier ending this time around compared to the play-off final defeat that brought the curtain down on his first stay at the Boro. But the 25-year-old admits there are huge similarities between 2014-15 and the current two-way Yorkshire scrap for promotion that has seen Leeds and Sheffield United swap places after each of the last five rounds of matches. “We had a similar thing at Middlesbrough,” he told The Yorkshire Post ahead of the tea-time derby with Sheffield Wednesday at Elland Road. Wise words from someone who has been there and done it amid the pressure-cooker atmosphere of trying to reach the promised land of the top flight. Leeds hold the advantage going into today’s programme. Marcelo Bielsa’s men sit a point above the Blades in what is now effectively a White Rose scrap to join Norwich City, six points clear at the summit, in clinching automatic promotion. 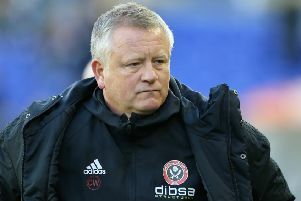 By kick-off at Elland Road, however, Chris Wilder’s United may well have stolen a march on their White Rose rivals. A message? Just keep it together, try and enjoy the situation if you can and ride the wave. Even a draw at Bramall Lane against Millwall will be enough to nudge the Blades back into the top two and leave Leeds needing to take something from Wednesday a couple of hours or so later. This will, in fact, be how it is for the next four games thanks to the Blades playing before their rivals from up the M1. Asked if this could work in Leeds’ favour or not, Bamford replied: “The pressure is always going to be there. But it was nice to play first in midweek (against Preston). “Of course, it would have been horrible had we lost. But, after having won, it meant we could relax the following night and see what happened with Sheffield United – and then concentrate on Sheffield Wednesday. Bamford’s double in midweek took his goal tally to nine from 20 appearances during a season where he played just 29 minutes in five months owing to a knee injury. With seven of those outings coming from the bench, such a return is impressive. Despite that, the £7m signing from Boro had come in for criticism following the recent outings against Millwall – when he missed a penalty – and Birmingham City. Bamford, in a similar vein to the stunning strike that opened the scoring at Deepdale, merely took this in his stride and chose to focus on the bigger picture. “Scoring two goals, I have to go in full of confidence and try to put in the same performance back to back,” he said. Even Bamford’s critics among the Leeds support – and he faced ironic jeers from some when finding the net during the warm-up on Tuesday night – could not have failed to be impressed by his display at Deepdale. Against a defence renowned for being physical, the former Chelsea trainee met fire with fire. So much so, in fact, that it was clear long before Ben Pearson’s red card early in the second half that the Preston man had been riled. Bamford’s tremendous work-rate was also in evidence – never more so than in the 18th-minute passage of play that saw him avert the danger by cutting out a cross deep in United’s penalty area before racing up the other end to fire narrowly over following a sweeping counter-attack. The only blemish on his night, in fact, came late on when a chance to bag the match-ball was spurned by the striker hesitating long enough to allow Ben Davies to get back and pull off a hat-trick saving tackle. Bamford’s challenge now is to take that fine display into what will be a tough derby today. “We all knew when Steve Bruce took the job what sort of team Sheffield Wednesday would be,” he added. “Steve did a great job with Villa last year. As for the promotion race, Bamford said: “The pressure is on Sheffield United but us as well. A massive club like Leeds, the expectation at the start of the season probably was not to go up automatically. “But, because of how well we have done as a team, I think everyone is thinking, ‘Wow, this is something special’.